A collaboration between non-profit organization ART Optimists (Mykolajiv, Ukraine), Center for Urban Culture (Lviv, Ukraina), Truc spherique (Zilina, Slovákia) and Igor Metropol Association (Budapest, Hungary). Virtual reality inevitably rises as technology develops. How we are going to survive, to live in this multi-layered reality? The project invites artists, art students, IT specialists and game developers to take part in workshops, where elements of a “survival kit” will be created and developed collaboratively. Each workshop will have a specific thematic focus and set-up: gaming, robotics and re-engineering. The aim of this “kit” is not only to create and collaborate, but also to think ahead. What can we change by using technology? What can we learn? How can we give solutions to questions that haven’t risen yet? 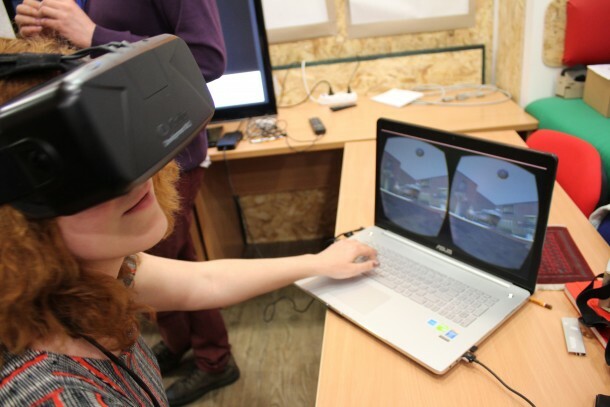 Participants had access to VR development technologies, such as Oculus Rift DK 2, Google Cardboard, 3D video production with GoPro cameras and an opportunity to create their own prototypes with the help of artistic and tech facilitators. The workshop participants present their prototypes to the public. Follow the process and results of the workshops on: survivevr.com! The project is part of TANDEM Ukraine exchange program “Dialogue for Change”. TANDEM is an exchange programme that assists cultural organisations in building long-term, international working relationships. The programme supports knowledge development for cultural managers and their organisations, and it creates networking opportunities with project partners from Europe and beyond. Since 2011, TANDEM has brought together more than 200 independent cultural organisations and supported the professional development of over 150 cultural managers coming from more than 80 cities and 25 countries in wider Europe. The project is supported by: MitOst e.V., Federal Foreign Office, European Cultural Foundation, Robert Bosch Foundation.